San Jose students will be among those benefiting from a new $55 million donation to help low-income students succeed. The donation by pharmaceutical giant AbbVie was announced Friday and will be divided among three organizations: Communities in Schools, City Year and the University of Chicago Education Lab. 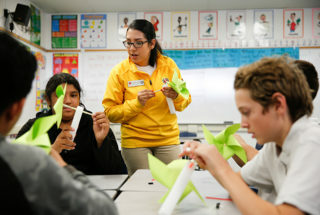 The San Jose branch of City Year will receive $1.6 million to expand its afterschool STEAM program focusing on science, technology, engineering, math and the arts. City Year, a nationwide AmeriCorps program that places young adults in schools to serve as role models for students, will receive an additional $3.4 million to improve and expand its math and literacy programs that are used throughout the U.S.
Pete Settelmayer, executive director of City Year San Jose, said the money will allow his organization to potentially reach as many as 1,250 additional students, exposing them to science and technology in a region where opportunities in those fields are plentiful. “We are in the heart of the tech industry. If we can expose [students] early on to what that means — it’s right in their backyard — they have a huge opportunity to advance as they move through high school and college,” Settelmayer said. City Year Chicago will receive $5 million to expand its program in Chicago Public Schools. All three of the organizations receiving the donation money serve low-income students in Chicago. AbbVie is based in North Chicago and also has offices in San Jose. Communities in Schools will receive $30 million, the largest gift in the organization’s 40-year history. Of that, $6 million will go directly to Communities in Schools of Chicago, which will use the grant to place full-time social workers in 16 additional high-poverty schools to provide struggling students with academic and social-emotional support. “It’s a transformational gift for Communities in Schools, both nationally and for Communities in Schools in Chicago,” said Jane Mentzinger, executive director of Communities in Schools Chicago. Communities in Schools is a national nonprofit that works to help disadvantaged students graduate from high school by connecting them with adults who provide social and academic support. The remaining $14 million will help the organization expand in other regions. Local chapters will compete for 10 to 20 grants, said Communities in Schools President and CEO Dale Erquiaga. He noted that AbbVie wanted to work with organizations that have a successful track record and are committed to evaluating their results. “One of the things that AbbVie really appreciated about the Communities in Schools model is our evidence base, and this many students all coming on board at the same time in diverse parts of our country will give us just another glimpse into what integrated student supports can mean in the lives of students all across the country,” Erquiaga said. Communities in Schools reports that 91 percent of high school seniors who received support from the organization in the 2015-16 school year graduated from high school or received a GED, with 80 percent improving their attendance and 88 percent improving academically. Nationally, only about 84 percent of high school students graduate on time, and the rate is even lower for students living in poverty. The $55 million will also benefit the University of Chicago Education Lab. As one of the University of Chicago Urban Labs, the Education Lab aims to study and assess innovative programs in Chicago Public Schools to improve student outcomes. AbbVie will contribute $15 million for the lab to evaluate innovative programs in Chicago Public Schools, including Communities in Schools’ effort to increase high school graduation rates over the next three years. AbbVie is a global pharmaceutical company focusing on immunology, oncology, virology and neuroscience. The corporation is committed to making $350 million in charitable donations in 2018; it made $100 million contributions each to the Ronald McDonald House Charities and to organizations providing relief to Puerto Rico after Hurricane Maria earlier this year. The corporation selected the three nonprofits because of their proven history of improving student outcomes and their ability to “leverage each other’s strengths,” said Melissa Walsh, AbbVie’s vice president of corporate responsibility and philanthropy. “We’re a research-based biopharmaceutical company, and so the way that we do just about everything here at AbbVie is driven by data and it’s driven by evidence-based methodologies,” Walsh said.